Halon Services | Haven Fire & Safety L.L.C. Halon is recovered utilising specialist equipment to ensure that there is no undesired environmental impact. The halon is then processed to remove contaminants and pressurizing nitrogen prior to repacking in bulk drums for re-use to critical users locally or via the US Halon Bank. Haven are a member Company and work strictly in accordance with the US based Halon Recycling Corporation code of practice which is recognized and accepted by the EPA. Halon is recycled and third party certified to ASTM / ISO standards. Detailed source data is available for all recycled halon held by the company. Halon reclaim and recycling is carried out in Mussaffa Abu Dhabi. 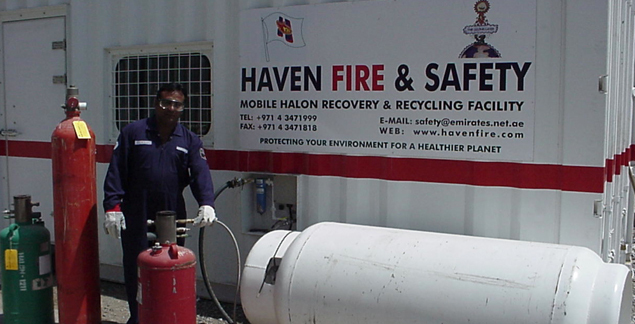 In addition, Haven Fire also own and operate a mobile halon recycling facility having equal performance and functionality to the Mussaffa facility which can be utilised worldwide.